French draughtsman, engraver and merchant of prints. He executed a large number of engravings after Boucher, Watteau, Gillot, and other French masters, and he is distinguished by his deep knowledge in arts. He had a valuable collection of drawings and prints, and on certain days of the week it was open for all artists and other visitors. He had a son, Jacques-Gabriel Huquier (1730-1805), who engraved the same subjects in the same manner as did his father. 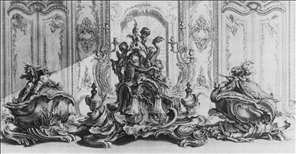 See more details about "Design for a Large Centrepiece and Two Terrines in Silver"